Most auto repair shop owners put plenty of work into their shop. They work to build efficient workspaces, to keep their customers comfortable, and to keep their employees happy. That work can pay dividends once customers see it for themselves, but unfortunately many shops don’t give people the opportunity. The easiest way to give potential customers the opportunity to see your auto repair shop is to take some great photos of it and post them on your website. These pictures aren’t just filler – they demonstrate the environment your customers can expect when they get to your shop. Customers who know little about cars may judge the work quality of your shop based on its appearance, so when it comes to providing a good visual representation of your shop, it pays to put your best foot forward. The good news is that it’s not hard to do. Get ready to be surprised by how easy it is to take a great photo! There are three key points to make yourself stand out among competitors when taking pictures – the camera, the lighting, and the purpose. One of the biggest mistakes that you can make is not taking enough photos. It’s free! Take plenty of photos from different angles and pick the best. For the best results, take photos of the jobs and parts of your shop you are most proud of. You will want to avoid pictures of a rusty car or the corner of the waiting room that could use a remodel. First, you’ll want to focus on the background. If your shop isn’t as spotless as you would like, you aren’t alone – but keep the mess out of the picture. Reposition yourself for a better background that isn’t distracting to the eye. The less mess to stare at, the more people will appreciate why you took the picture in the first place. Besides taking photos of the work you do, showing your waiting room is important. Have a place for customers to sit and work or relax while their car is in the shop. A clean and comfortable space plays into higher customer satisfaction, which leads to repeat customers. 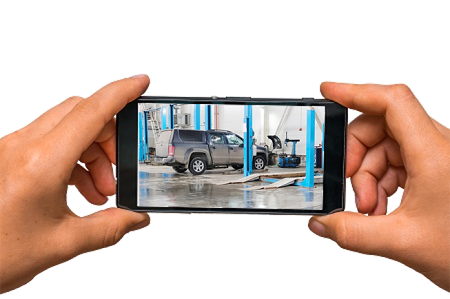 To capture the best pictures to promote your auto repair shop, take the lighting into consideration. Natural light can play an important role in how your photos turn out. Using the sun’s natural rays through windows or open garage doors can produce beautiful photos. The important thing to remember is to work with the sun, not to compete against it. Simplicity is better. When you’re ready to snap a quick photo, think to yourself, ‘What do people want to see when they look at this photo?’ and focus on that. To learn how Repair Shop Websites can help bring business to your shop, call us at 866-665-1605 or email us at Team_RSW@RepairShopWebsites.com.